I've been wanting to make a cooler spacer to keep meat out of the melted ice and also keep the drain plug clear so water drains. I was thinking about taking a piece of UHMW and cutting it to fit the bottom. I figured to screw 1.5" UHMW blocks to all corners and some in the middle to space it up off the bottom. Drilling holes through out the top would allow the water to drain down. I figured 1/4" UHMW for a top and 3/4" thick to make the blocks out of. I used an old oven rack, and just bent the sides over to make it stand off the bottom a little more. They sold them that way looooonnng ago. I do same except use a fridge rack and bend the sides over. I made a frame out of PVC, then strung plastic clothes line cord through it in a diamond pattern to create a shelf for holding stuff up out of the water. (sandwich meat, cheese, etc.) I would think something similar could work for your purpose as well. Use frozen milk jugs filled with water ( lid on). Your meat will cool and you don't get soggy nasty bleached out piece of blah. ( unless your into tofu) Just keep replacing the thawing jugs with frozen ones. Or you can fill PVC piping that will fit the bottom of your cooler with water ( glue one cap on fill most of the way with water then glue the other cap on ( or salt water) and keep them in a freezer, then place in the bottom of the cooler and place meat on top, then lay more frozen PVC tubes on top of the meat. Just harder to tell when the PVC tubes are thawed then with the milk jugs. And it's more hassle replacing the tubes under the meat. But both work great. If your worried about the blood draining off, spread some diapers and lay on the bottom of the cooler. ( or line with Kotex). The blood isn't going to hurt anything though, meat has blood in it. How ever, the PVC tubes do allow the blood to drain to the bottom, and keeps the meat up out of it, if blood makes you squeamish. Last edited by critter69; 10-11-2018 at 09:37 PM. I like the idea of keeping the drain plug clear but I WANT my meat in the water. I hear people talk all the time about how it washes all the color out of the meat and makes it grey and nasty. Yea that just is not the case at all. I wet age all of my meat for 7-10 days. The outside 1/8-1/4" will be grey when you process. The rest is still very red. If you like your meat to have a strong "gamey" flavor, yea don't wet age. But if you want to mellow it out some, wet age for sure. But don't listen to people on the internet, including me. Most folks have a lot of opinions and little experience. Try it for yourself and draw your own conclusions. I have yet to eat any animal that tasted bad but have been told that many are no good to eat. Inaccurate info has a way of perpetuating itself. 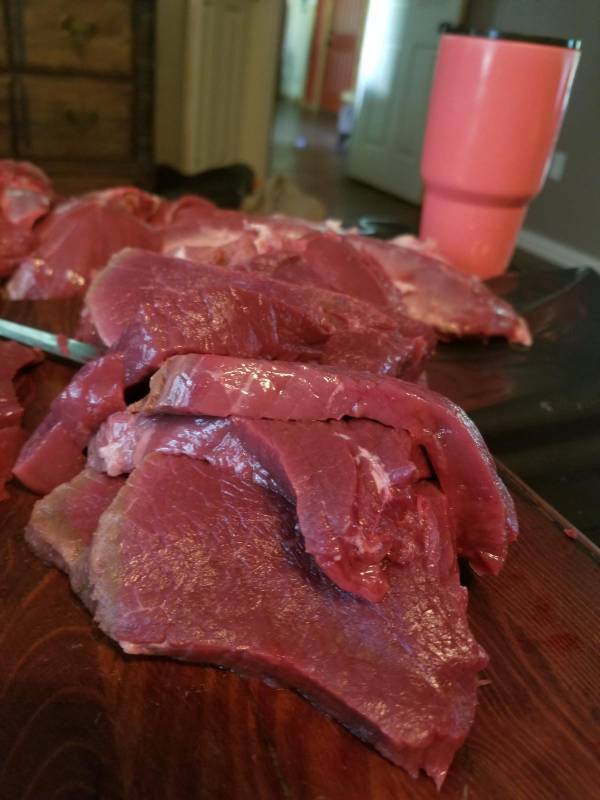 I have never had any deer meat taste gamey and I don’t soak mine in water. Last edited by critter69; 10-12-2018 at 09:10 AM. Not what I was talking about but looks like they sell a "cooler tray". Can be found on Amazon for the same price. Last edited by BlackHogDown; 10-12-2018 at 09:11 AM. Good. I didn't say it would tast gamey if you don't soak it. Notice the quotation marks around gamey. By "gamey" i mean tastes like deer. If you want to mellow that flavor some, let it soak. We did a shoulder roast last night that most folks would have thought was beef and it was from a big muley buck. I just get a little annoyed when people act like getting meat wet is the anti-christ. Try it for yourself. You might just like it better. Here is some "nasty grey meat" from the muley buck i killed this year and wet aged for 10 days.